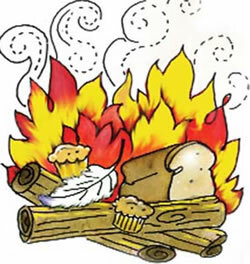 On the morning before Passover, chametz may be eaten until the fourth hour of the day. After that, only foods that are kosher for Passover are eaten. We don’t eat matzah, though. We’re saving that for the Seder. Since even a minute amount of chametz is prohibited, we carefully rinse, brush, and floss our teeth, to ensure that we really have gotten rid of all the chametz within us. Now we’ve got an hour to put away all the chametz utensils, and any other chametz that will be sold over Passover, in their designated areas, and gather the rest of the chametz together for the burning of the chametz. You would need to search for Chametz the night before you leave without making a blessing. You can find a complete guide as to what you should do at this link both with the Chametz at home, as well as what your responsibilities are at the place you are staying for Pesach. When searching for leavened foods, chametz, on the night before Passover we carry a candle, a spoon and a feather. I understand that the purpose of the candle is so that we can see the bread, but is there a good reason for the spoon and feather? There are reasons for both the spoon and the feather. Having to make my tooth-brush... & electric shaver-head..."Kosher for Passover"? I know, it might sound silly, but I own some 'expensive and delicate' ones in my possession. Please advise if it is still permissible to keep them in my household, - or if not, how to "kasher' them without destruction.